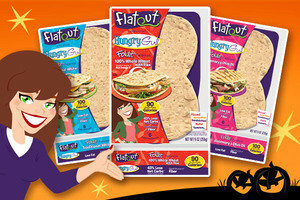 Today's delicious finds are brought to you by Flatout Flatbread. If you've shied away from standard bread because of all the carby calories, these foldable figure-eight flatbreads are here to save the day! We're especially crazy about the 100% Whole Wheat with Flax Foldits, which have just 90 calories, a whopping 7g fiber, and 43% fewer net carbs than sliced bread. The other varieties rock too: Traditional White (perfect for PB&J) and Rosemary & Olive Oil (schmancy grilled cheese, anyone?). Use them to make sandwiches, pizzas, tacos... You name it! With great texture and perfect taste, Foldits truly are the best thing since sliced bread... In fact, they're BETTER. 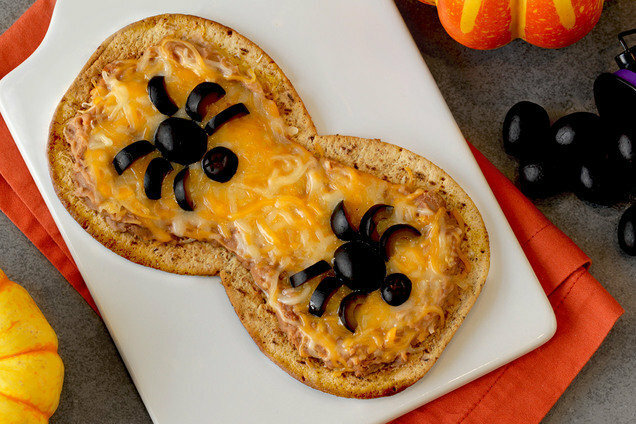 Ready for a frighteningly delicious spin on tostadas? You got it! Bake flatbread until hot and lightly browned, 8 - 10 minutes. Spread with beans, and sprinkle with cheese. Bake until hot, about 2 minutes. Slice one olive in half lengthwise. Place one piece in the center of each flatbread half, cut side down. Cut each of the remaining 2 olives widthwise into 4 slices, for a total of 8 slices. Use 2 of the end slices to form a “head” above each of the olive halves on the flatbread. Cut remaining slices into half-moon shapes, and arrange to form 12 "legs." Click for savings on your next TWO Flatout purchases... That's right; you can print the coupon twice! Then check out the store locator (we get ours at Walmart), and stock up STAT. It's October 26th, National Pumpkin Day! Mix some canned pumpkin with sweetener and cinnamon, and spread it on a toasty Foldit for a sweet snack with pumpkin-pie flair! Do you have bread-loving pals who could use product news like this? Click "Send to a Friend" and share the wealth!